Green felt bag in woodland style made of merino wool and finished with mulberry silk tops and little 3D volcanoes with silk fabric on their bottoms. This green felt bag has a beautiful meadow theme with red poppy flowers. It is large and pretty massive - perfect, if you like to take everything with you. This pastel felt bag has an oblong shape. It is large & deep, perfect for spring and summer. If you love handmade items and like its colors, it is for you! 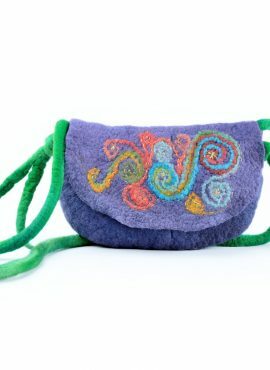 This felt shoulder bag has unique design, beautiful turquoise and brown tones and lovely felt flower. It is just perfect to celebrate spring and summer! 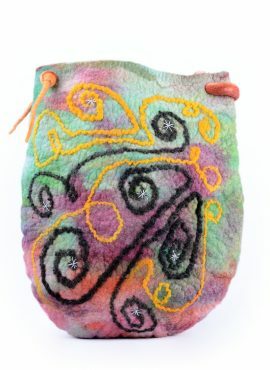 This felted purse has a folk embroidery pattern on its cute flap. It is comfortable, durable and practical and will help you face all your daily challenges! This pink felt bag is really unique. It has an abstract painting made of natural materials on its front side and the colors you need to look sweet & lovely! 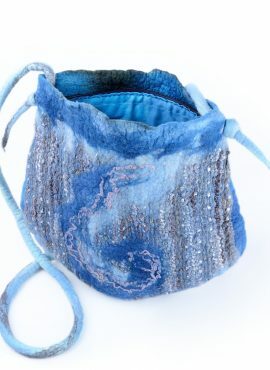 This blue felt bag has large size and beautiful texture with shiny threads. 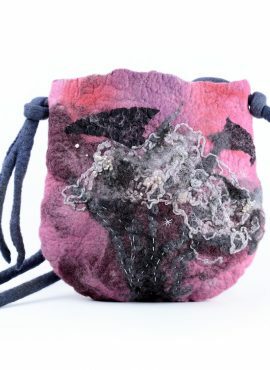 It is hand felted and equipped with a zipper and a pocket. This felted boho bag has an impressive colorful fringe and ethnic pattern made of silk fabric. It is perfect for summer for power flower ladies.